Virginia Rose (shown) ~ "Queen of the gardens, a symbol of beauty, seduction and charm is found in the Virginia Rose Acca Kappa, an exquisitely feminine declination. The nobility of the flowers such as rose, lily of the valley and geranium, unfolds gently joining itself with the solar freshness of citrus, lemon and grapefruit. The bright and enveloping agreement evolves and fades into the sensual notes of amber and precious rose woods." In 100 ml Cologne. 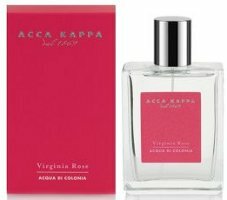 Giardino Secreto ~ "Acca Kappa's stunning Giardino Segreto Eau de Parfum comes from a secret garden... a magical place with enchanting notes of jasmine, rose and a spicy woody heart. A truly feminine perfume designed to seduce and capture the hearts of men." Additional notes include pink pepper, coriander, ylang ylang, patchouli, vetiver, sandalwood, cedar, ambrette, vanilla and musk; in 100 ml Eau de Parfum. Giallo Elicriso ~ "Giallo Elicriso takes its inspiration from the magical coastline of the Mediterranean. This masculine scent has a fresh, spicy, woody appeal with notes of vetiver and cedarwood." Additional notes include citron, aquatic accord, violet leaves, helichrysum, white pepper, nutmeg and benzoin; in 100 ml Eau de Parfum. *Giardino Secreto and Giallo Elicriso were introduced in 2012, I am not sure when Virginia Rose launched. They also have a white moss one, very simple but lovely. Looking forward to test all of these! though it might be a “mission impossible” as they are as hard to get in the US as they are in Argentina. And I really like their Calycanthus. Don’t know if they still have a shop in Vegas or not, but they do have an online store in the US — but none of these fragrances are there yet.